35mm. That’s right. I’m musing on old school photography, shooting 35mm film in workhorse cameras like the Canon AE-1 and the Pentax K1000. After investing a chunk of change to go digital and buy my “big girl camera,” I got pulled back to analog. I was fortunate to win a Canon AE-1 a few years ago and my love for shooting 35mm took off. I had forgotten the thoughtful process of loading the film over the sprockets in the camera back, the sharp-sounding click of the shutter, the delight in cranking the film-advance lever. And that doesn’t even begin to speak of the fun in shooting film. For example, you can focus your lens on shooting vintage content with film, a seemingly vintage medium these days (although we #believeinfilm here at Mortal Muses! 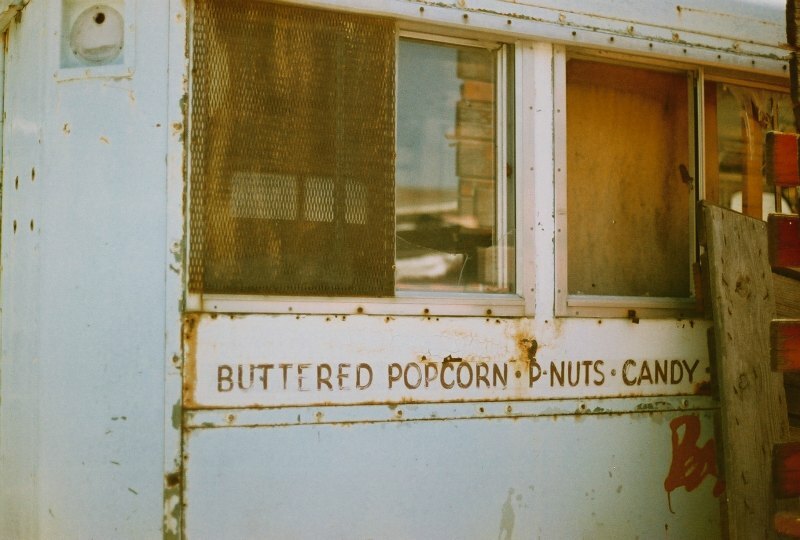 ), like I did here with this old snack truck. Or you can play with multiple exposures (a total favorite technique of mine) like n p a did here at the carnival. 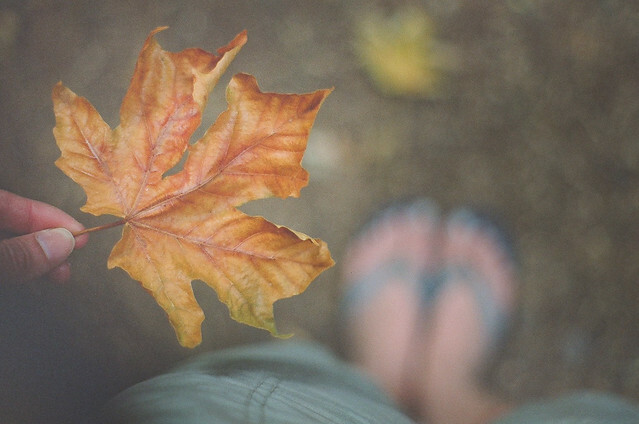 You can let the dreaminess of film come out to play like this autumnal capture by after october. 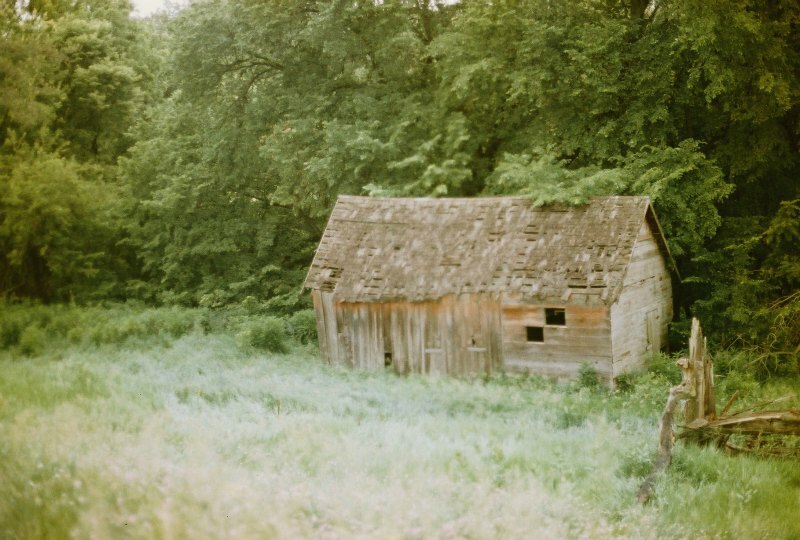 Or you can be surprised at the effects of expired film like in my photo of this decrepit barn with the brownish tones that come through in the leaves and grasses. Cara shared last week that you can even put 35 mm film in the Holga which typically uses 120 film — check out the results! I totally want to try that out in my Diana camera. I’d love to hear some of the other ways you are using 35mm film in your photographic adventures. Do share! Gorgeous. There is a life, a soft subtly to film that breathes beyond the subject and composition to bring life to the image. great shots and wonderful article!! i too have been shooting old school with my canon 3 and loving every minute!! Even though I borked my first roll of film in the AE-1 but I will soldier on and try again in the hopes of creating images like these. that top image makes my heart go pitter-patter. that particular faded blue with those orangey yellows – gorgeous! I love shooting vintage with vintage too. I am so digging out my dad’s old AE-1 and giving this a go. Thank you for the inspiration! Beautiful shots Meghan! I keep telling myself I’ll break out my old rebel or my sister’s or mother’s old 35mm cameras. I wish we had my Mom’s original Pentax the I learned on back in high school. Sigh…will have to try and track one down one of these days. Love that you highlighted 35mm film cameras here. I feel like they don’t get enough love, between medium format and polaroids. Beautiful examples, too. I use my father’s old Nikon F, and love it so much. I am in love with my Minolta X700. It has an easiness to it. Wonderful post.